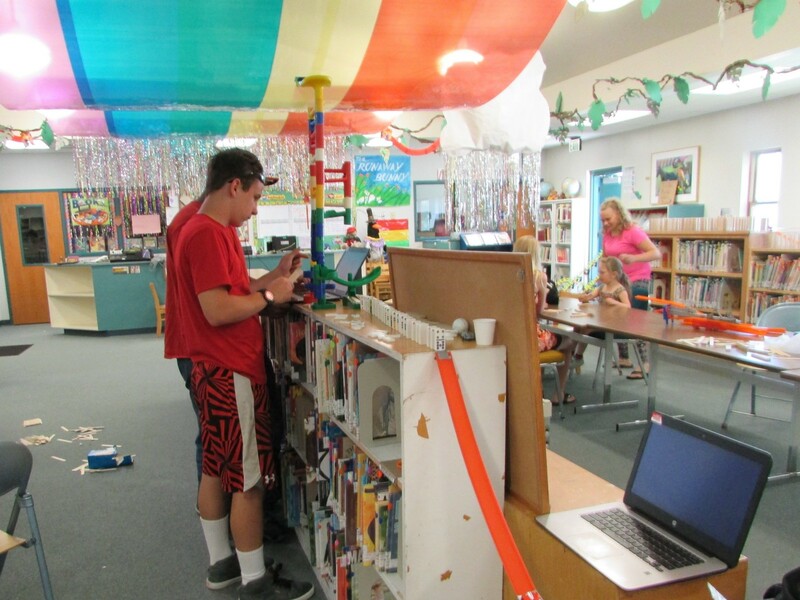 The recipe for summer learning in Newport, Wash., looks like one part science lab, one part reading room, and two parts fun. 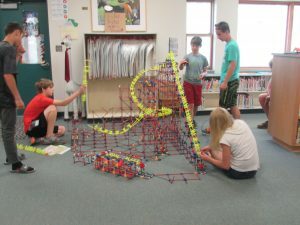 The 80 students participating in The Summer of STEM program are building roller coasters, creating cars out of pasta, engineering popsicle stick bridges, constructing elaborate towers for marbles to run through, studying chain reactions with dominoes, working on their reading, and the list goes on. Kelsi, an upcoming 7th grader, said her favorite part of the summer program so far was the roller coaster. Each team of students built different parts of the structure, and she said it was confusing to try to fit them all together, but once they did the result was satisfying. “It keeps my mind active during the summer,” Kelsi said of her Summer of STEM experience. Along with STEM-focused activities and skill building, students of all ages in the program also focus on their reading, said Vickie Blanchet, the program director for the Grizzly Discovery Center, which is Newport School District’s 21st Century Community Learning Center expanded learning program offered afters school and in the summer. The summer program is also funded in part by School’s Out Washington’s Feed Your Brain project. “We’re working to prevent the summer slide in reading,” Blanchet said. “This opportunity is for kids to use their imaginations to think critically while having fun. We wanted students to have the opportunity to explore a wide variety of content,” Blanchet said. Summer of STEM is one of the primary summer learning opportunities available to students in Newport, which is a town of about 2,000 people located on the Idaho border in Northeast Washington. Each day for the 20-day program, students break up by age group to engage in STEM challenges. Students work in different small groups, and they use different planning strategies, such as thinking quietly, going on a walk to discuss ideas, and dividing work up among team members. “The idea is to help build students’ ability to think critically, work in teams, and problem solve,” Blanchet said. Younger students can bring their families with them on Monday mornings for breakfast and book-reading, followed by a related STEM activity. For example, Blanchet said, students and families might read “The Three Little Pigs” and then build a wolf-proof house. One of the goals of the program is to keep students reading at the same level or better compared with the beginning of summer. The STEM projects students work through expose them to all sorts of different engineering challenges, while also helping them build skills that are important for school, careers, and life. Alex, an upcoming 9th grader, said teamwork is an important part of the marble tower he and his teammates were building. They also were trying different materials to get the marble to finish its route through the tower successfully. Perseverance was a skill Amber cultivated, perhaps inadvertently, as she studied chain reactions with dominoes. Her domino structure got bumped several times, and the chain reaction ran, so she had to build it again. “It’s try-fail, try-fail, try-prevail,” she said. Thank you to Vickie Blanchet and the students of The Summer of STEM for sharing their story with Ready Washington! To follow all of The Summer of STEM activity, check out the Grizzly Discovery Center blog.